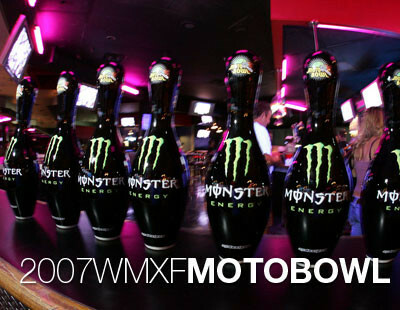 Click the following link for a 25-photo gallery of images from the 2007 WMXF Motobowl . The Women's Motocross & Supercross Foundation (WMXF) hosted their Fourth Annual Motobowl at Concourse Bowl in Anaheim, California last night. Monster Energy was a presenting sponsor, and as usual, SX and MX fans bid on eBay to bowl with their favorite riders, which included a who’s who of MX talent. In addition to plenty of food, drink, and good times, there were raffles, and silent auctions for an amazing array of rider gear and other goodies. Maybe our favorite moment of the night, though, was when Grant Langston sucked down a bunch of helium from one of the balloons used to decorate the site, and started working through his podium speech. "Well, my Yamaha worked great out there..."
This annual event raises money for a variety of causes, and the WMXF is always ready to help out riders in need. If you missed out this time around, be sure to mark your calendar for mid-August next year, when you should start watching for their eBay auctions. For more info on the WMXF, or ways that you can support them, check out www.wmxf.org.